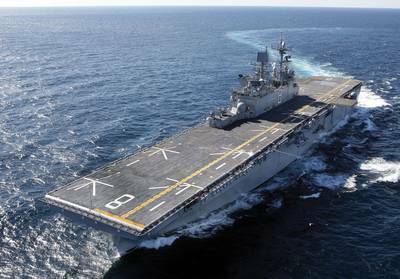 USS Makin Island (LHD 8) is the last in a series of 8 amphibious assault ships of the WASP-class built by Northrop Grumman Shipbuilding at its Pascagoula, Miss. shipyard. Though last, it is the first in the series fitted with hybrid electric gas turbine propulsion, and recently returned to its San Diego homeport after its first deployment. “During the seven-month deployment, the ship’s hybrid-electric propulsion system saved more than four million gallons of fuel resulting in an estimated cost savings in excess of $15 million,” the Navy claims. 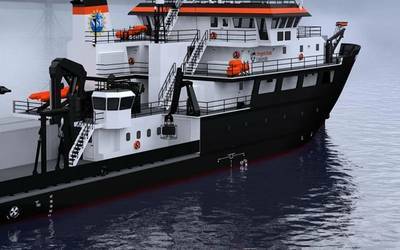 Maritime Reporter looks at the technology that makes this possible. Commissioned in 2009, Makin Island uses diesel-electric propulsion at speeds under 12 knots and is the first amphibious assault ship to be powered by gas turbines, used at higher speeds. The diesel-electric/gas turbine combination results in lower fuel consumption, reduced carbon emissions, and lower annual refueling costs. The earlier vessels in the series are fitted with steam plants, which were also used for generating the electricity for onboard consumption. Eliminating the steam plant also reduces engineering department manning requirements and workplace hazards associated with boiler systems. The purpose/mission of USS Makin Island is to embark, deploy, and land elements of a Marine landing force in an Amphibious Assault by helicopters, landing craft, and amphibious vehicles. The secondary/convertible mission for Makin Island is that of sea control and power projection. The shis has an overall length of 258m (847 ft.), overall breadth 36m (118 ft.) and design draft of 8.2m (27 ft.). The waterline length is 237m (778 ft.), waterline breadth 32m (106 ft.) and maximum draft is 8.5m (28 ft.). The gross tonnage of the vessel is 12,821 and displacement 41,649 tons. The ship can carry up to three LCACs or 39 Expeditionary Fighting Vehicles (EFVs). The typical aircraft load-out is 12 CH-46 Sea Knight helicopters or 10-12. MV-22 Osprey tilt-rotor aircraft, 4 CH-53E Sea Stallion helicopters, 7AH/UH-1 attack/utility helicopters, six AV-8B Harrier attack planes (6 F-35B Joint Strike Fighters in the future), and 2 MH-60S Search and Rescue helicopters. The ship typically embarks with approximately 100 officers and 1,100 crew, and can carry about 1,700 Marines. USS Makin Island is powered by two LM2500+ gas turbines supplied by GE, each with a power of 35,000 hp, and six 4,000kW Fairbanks Morse diesel generators which feed the vessel’s electrical distribution network and two auxiliary electric propulsion motors. The total diesel generating power is 24,000kW (32,630hp). The LM2500+ gas turbines, which together provide a power of 70,000shp, are used for high speed service propelling the vessel up to some 25 knots through a mechanical geared two-shaft arrangement with 5m diameter controllable pitch propellers. The Auxiliary Propulsion System, or APS, consists of GE’s (earlier Converteam’s) MV3000 variable frequency electric drives and two electric propulsion motors, supplied by GE, Power Conversion, coupled to each gearbox also supplied by GE. Since the gas turbine propulsion plant is designed to meet all the mission requirements, the electric propulsion system could be designed primarily to maximize thru life cost savings. The largest COTS ‘commercial off the shelf’ electric propulsion motor that could be utilized was a 5000hp induction motor. Two propulsion motors provide a ship speed of up to 13 knots with diesel-electric propulsion only. At the sea trials a speed of 13.7 knots was reached. The conversion from steam to gas turbines utilizes a single gas turbine per shaft. This was made possible with the commercial launch of LM2500+. Its 25% power increase allowed for a direct replacement of the installed power on the previous vessels in the ship class with a single gas turbine. Replacing steam heating to electrical heating required additional electricity generating capacity. This required a higher voltage of the ship’s network, which was consequently increased to 4160V from 450V. The philosophy of the electric load profile is that a maximum of 9MW of the power generated is required for resistive heating loads. This amount of power is only required during cold weather, which leaves this power available for other users in milder conditions. A decision to reallocate this capacity when not needed allowed the design of an electric propulsion system to move forward. As these ships spend over 90% of their life at 20ºF (-6.6ºC) or above, excess power is thus always available. GE’s LM2500 is the world’s most widely used marine gas turbine. It powers more than 400 ships in 30 world navies. 1200 engines have more than 11 million hours in naval service. The LM2500+ maximum output is 35,000shp (26,100kW) Navy Standard Day (NSD). The LM2500+ has one additional stage of compressor blades, and is available with a power of up to 40,500shp (30,200kW) and the newest fourth generation LM2500+G4 has a power of 39,240shp (29,280kW) NSD. The LM2500+ marine gas turbine can be housed in a highly shock-resistant, thermal, acoustic enclosure on a mounting base. The enclosure attenuates noise in the engine room and provides sensors for inlet icing and fire detection. It also houses fire extinguishing equipment. The power generation system consists of six 4,000kW synchronous generators connected directly to six 4160 VAC generator switchboards. The distribution system consists of eight 4160 VAC distribution switchboards supplying 450V load centers via step-down transformers. Each propulsion motor is supplied from a 3 phase GE’s MV3000 variable speed electric drive that is fed by a 4160V (3-phase):724V (12-phase) isolation transformer. Each drive has an input power of 4,000kW, and is fitted with a 24 pulse width modulated rectifier (PWM) and microprocessor controller, with locally placed control panel. It is arranged with closed circuit water cooling. The 12-phase secondary of the isolation transformer, in combination with the 24-pulse rectifier section of the electric drive, limits harmonics from the APS to within MIL-STD 1399 Power harmonic limits. This is a critical interface requirement at the distribution bus which has power supplied by the diesel generators. The 3,678kW (5,000hp) propulsion motors of the APS system are water cooled squirrel cage 3 phase, 592V, 100-1800 rpm induction motors. Two independent switchboards feed each APS. The APS can be fed either by the diesel-generator (SSGD) placed in the same machinery room or using the overall 60Hz distribution system (IPS mode). The APS can either be operated in Speed Control mode or in Torque Control mode, the later preferred to limit load cycling on the electric plant due to seaway, manouvering etc. The variable speed drive (VSD) control system of the APS were tuned and the Machinery Control System (MCS) power management interface revised to provide a marked improvement with regards to the system power and frequency oscillations observed during the sea trials. The vessel has also an advanced machinery control system and a water mist fire protection systems. “The Navy was always very clear that it would not sacrifice operational performance in the search for economic advantage,” said Paul Thompson, GE Power Conversion’s Naval Director. ”They wanted reliability and performance plus economy which is why Commercial Off The Shelf (COTS) equipment was always going to form the basis for system design. For the APS propulsion motor an AC induction machine was preferred since it is considered to be simpler, cheaper, smaller and lighter than a standard synchronous motor that needs separate field excitation and associated control support. It’s generally considered to be more robust too and is likely to require less routine maintenance than other motors designs. Both the gas turbine and the electric propulsion motor power the same reduction gear train through synchronizing self shifting clutches. The rated shaft speed is 90rpm. Propulsion system transitions are completely automated. When switching from gas turbine (GTM) to electric propulsion, the APS is brought up to speed, then the GTM reduces power down to idle for five minutes to cool down, before the APS assumes the complete propulsion load. The machinery system with components was full scale tested to meet the requirements of the U.S. Navy. Tests included thermal stability, vibration, full torque, full speed, 110% torque at 0 rpm, efficiency, air bone noise, local and remote control, and for electromagnetic interference and shock testing. The combined electric/gas turbine systems onboard were selected due to the U.S. Navy’s desire for a proven commercial off the shelf system that could be developed to meet critical Navy requirements and reduce cost. The selected machinery combination also greatly reduces the amount of time required to bring the ship’s engines online, improving the ability to quickly get underway and respond to emerging threats or humanitarian crises. The ability to select the best combination of power plants to match the immediate power requirements provides flexibility in operation and reduction in operating costs. Amphibious assault ships spend approximately 75% of their underway time travelling at 12 knots or less. Therefore, Makin Island can use its electric auxiliary drive the majority of the time, saving fuel and reducing wear and tear, and related maintenance costs, on the ship’s primary engines. Intermediate speeds of 15-16 knots were reached with best fuel economy by going with one gas turbine a little too fast, and then switching to only electric drives going 10-13 knots. According to NavSea, the crew size could be reduced by 80 to 90 engineering personnel. Beyond the environmental and energy-saving advantages of USS Makin Island’s propulsion system and all-electric auxiliaries design, the ship uses a stern flap to improve fuel economy, anti-fouling coatings to minimize hull drag, and solid state lighting to reduce energy use. The economic benefit was quickly realized by operating the vessel on the APS instead of the greater fuel-consuming steam turbines. At a ship speed of 12 knots, the initial fuel savings on the trip from the shipyard in Pascagoula, to the vessel’s home port in San Diego, CA around the southern tip of South America, fuel savings of over $18,000/day were reached as compared to steam turbines powering the vessel and its electricity producing generators. The gas turbines are calculated to offer 12% fuel savings compared to a steam plant. The electric drive offers 30% fuel savings compared to gas turbines and 43% compared to a steam plant. The US Navy expects over the course of the ship’s lifecycle to see fuel savings of more than $250 million. “As the Navy’s first operational test platform for this hybrid-electric propulsion system, our fuel efficiency directly enhanced the ability to operate forward for longer. 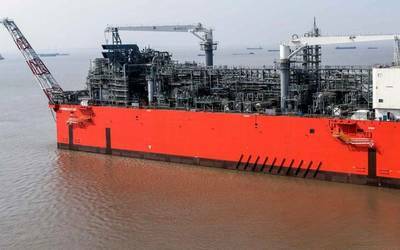 Additionally, our significant fuel cost savings, coupled with our lessons learned, will serve as a solid foundation for optimizing this ship, as well as current and future ship designs,” said Capt. Cedric Pringle, Makin Island’s commanding officer when the ship returned home from its first deployment.